A 47 year old male was admitted to ICU following a high speed MVA. On arrival in ED, he had a GCS of 7 and was intubated for airway protection. Apart from his reduced conscious level, he appeared to have no other injuries. Trauma radiographs, including a chest x-ray and plain x-ray of his pelvis, were unremarkable. CT scanning of his brain and C-spine identified a small frontal contusion, but no cervical spine injury. He was admitted to ICU for ongoing care. On admission to ICU, he had a routine chest x-ray. What are the most striking abnormalities on this chest radiograph? What is the pathological explanation for the appearance of a possible pneumothorax and what could be the causes in this case? The presence of air in the pleural space (i.e. a pneumothorax) enhances the contrast between the lung and the diaphragm and chest wall, such that the costophrenic rescess becomes more apparent, showing up as a “deep sulcus sign” on the CXR. Iatrogenic – during insertion of the subclavian catheter (Less likely as it has been sited on the contralateral side [but still worth mentioning as it displays an open mind and a ranking of probability]). How would you clinically confirm your radiographic suspicion of a pneumothorax? 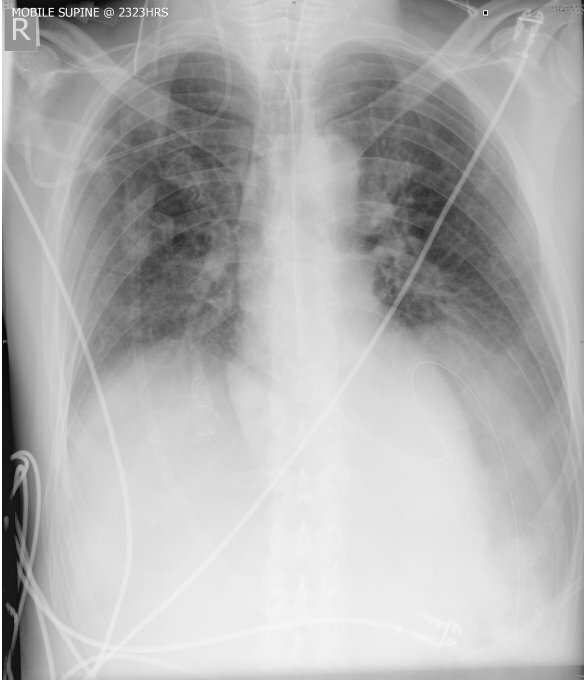 How might you confirm your radiographic suspicion of a pneumothorax from the ventilator parameters? Rising mean airway pressure, especially in volume control mode. An increasing end-expiratory airway pressure is also recorded. Pressure volume loop may start to demonstrate a “bird’s beak” appearance [See the “Respiratory monitoring” study notes in the Fellowship exam section]. Outline how bedside ultrasound might be used to confirm or refute the diagnosis? In M-mode, the replacement of the normal “seashore” appearance with intermittent touching of lung tissue against the chest wall with inspiration, suggests a small pneumothorax. With a larger pneumothorax, the lung will no longer touch against the chest wall. The ICU Sonography website, at http://www.criticalecho.com/content/tutorial-9-lung-ultrasound, has a good tutorial on lung ultrasound, with plenty of still images and recorded cine-loops. The site is run by a couple of FJFICM intensivists from the Christian Medical College Hospital in Vellore, Tamil Nadu and is well worth a visit.